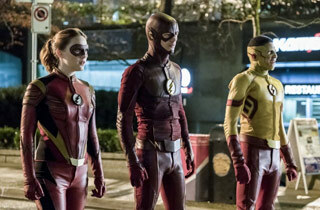 Season ReviewWhen a show is pretty solid right out of the gate, like with the first season of CW’s Arrow spin-off, The Flash, the bar is set pretty high for subsequent seasons. Season 2 of Flash wasn’t too shabby, upping the stakes a bit along the way, but it went for a much darker tone. (JFH didn’t review it only because we did not receive a review copy last year.) The main problem the show has had, so far, has been starting out fairly grounded in the first season and then getting increasingly more science-fiction based when it comes to the villains and even our heroes. By season 3, we have alternate worlds and dimensions — a seemingly infinite number in fact — and lots and lots of instances of time travel. Granted, we’re talking about a show based on a popular DC comic book, and this season largely deals with a fan favorite comic book arc called “Flashpoint.” In fact, season 3 opens with “Flashpoint,” with Barry having spent the past three months of his life living in a new reality where he’d gone back in time, saved him mother’s life, and has been living happily with his parents all this time. But of course, it can’t stay that way, so when he tries to undo what he’s done, he’s permanently altered his reality and the reality of those around him, even creating new characters in the process, like Tom Felton’s Julian, who is Barry’s new partner at work. But these timeline alterations are just one example of how weird the show has gotten and continues to get. But to be fair, it’s a television series that has decades of source material that was previously drawn on comic book pages and often aimed at young readers, so it’s difficult to fault it when it veers pretty drastically into the realm of the fantastic. The Flash‘s schizophrenia with being kind of all over the place with its sci-fi leanings, threatened my interest at times, but when I pushed on, I found myself continuously getting sucked back in. 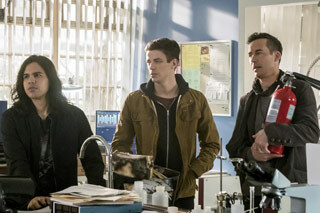 I really like Barry as a character, Joe West as his adopted father, and his buddy Cisco. I also like Caitlin and really feel for her as she goes through some really awful stuff with her Killer Frost powers. Her subplots throughout the season definitely had me worried about where they were planning to take her, but the showrunners did a fair job redeeming her along the way as well. And I have to hand it to Tom Felton and the writers for introducing Julian as an absolutely awful addition to the cast, only to turn him around and give him some endearing qualities. And while the writers continue to seem like fish flapping on the hot sand trying to come up with new excuses for keeping Tom Cavanagh as part of the cast after the events of season 1, I’m still happy to see him show up each week. It’d be nice to have some sense and normalcy brought to his presence going forward, but he proved to be some good, needed comic relief in season 3. The only real character I am still having trouble warming up to is Wally West, AKA Kid Flash, who still feels kind of like the little kid brother who is hanging around the big kids and doesn’t really quite fit well into the main cast. The content of The Flash in season 3 is on par with previous seasons. There isn’t much by way of gory violence, but there is plenty of violence, and some of it is unsettling just because of its creepy sci-fi nature. The language is moderate, with occasional but episode-to-episode uses of “Oh my G-d”‘s, “S.O.B”‘s and “h*ll,” “d*mn” and “-ss.” There isn’t much by way of sexual content, but two characters who aren’t yet married move in together (and sleep in the same bed), and the episode “Duet” goes way out of its way to present a female character in an alternate reality with two gay fathers and try to pass this off as a normal thing. It makes zero sense for the episode, characters, or even the show, and just feels very much like an agenda-pushing thing than anything else. This show is aimed at families and teens, so when the content gets a bit rough, it makes you wonder if the showrunners forget who the target audience is or just don’t care. 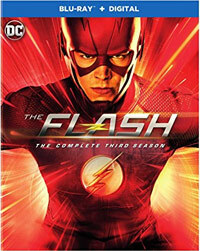 For the most part, The Flash‘s third season is an entertaining science fiction driven comic book television show. 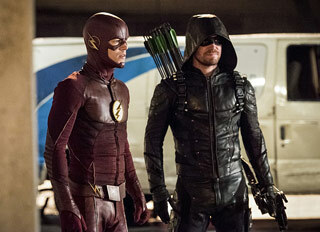 I would probably venture to say it’s been the least strong of the show’s three seasons thus far–which, admittedly, using Arrow as an example, worries me some about the show’s future–but it still has enough that I like about it to keep me interested enough to anticipate the fourth season, even if this season’s finale and season 4 setup feel a bit lazy and repetitive in nature. Otherwise, it’s a good (albeit flawed) show with strong themes of family, loyalty, overcoming our weaknesses, forgiveness and heroism that can inspire viewers. Villain School: The Flash Rogues (7:42) is all about The Flash‘s comic book mythology, talking about the villains known as “The Rogues,” and how they fit into the television series. This featurette addresses The Rival, Mirror Master, and Doctor Alchemy. Deleted Scene from “The New Rogues” (1:13) – Jesse and Wally talk before she leaves for Earth 2, and she thanks him for his help. “Invasion!” Deleted Scene (0:54) – While in the presence all of the superheroes, HR records audio notes for a book he’s writing, but Thea catches him in the act. “The Present” Deleted Scene (0:32) – Prometheus is shown having some kind of ceremony with his followers and The Philosopher’s Stone. “Borrowing Problems from the Future” Deleted Scene (1:15) – Joe and Wally talk at the police station about the heroics of Kid Flash. Rise of Gorilla City (9:08) is all about making a cinematic experience for TV and the special effects used. Honestly, the effects are not great, but as the filmmakers excitedly express, it’s unusual for this scale of special effects to be used for a television show. They also talk about making bigger moments and experiences for the character of Grodd here and going forward. The Flash: Hitting the Fast Note (4:08) is about the original songs written for the episode “Duet,” and composer Blake Neely writing music for this special episode. The Flash: I’m Your Super Friend (2:43) – This is the song from “Duet” played to behind the scenes footage from the episode in a sort-of music video form. Synchronicity in a Flash (20:59) – Blake talks about getting to record on the scoring stage where the famous Warner Bros. cartoons of old and the original 90’s Flash show were composed. Blake and the show’s cast talk about the music for “Duet” as well. We then see footage of the symphony playing live during the recording process. “Wrath of Savitar” Deleted Scene (1:31) – Wally and Jesse commiserate about their lack of control over the situation with Savitar. “Duet” Deleted Scenes (2:40) – There are two here. There’s an alternate opening scene where little Barry talks with his mom about losing a best friend, while the second scene has HR giving Wally a “Kid Flash” coffee from Jitters and a pep talk. The Flash: 2016 Comic-Con Panel (29:50) – I usually like seeing these San Diego Comic-Con panels on the Warner Bros. show releases, but this time, an annoying writer from TV Guide serves as the moderator to guide the questions, but it’s all speculation that has since not only been answered already, but a lot of his speculation is wrong and makes this panel largely irrelevant. There is a fun little moment, though, where the moderator awkwardly encourages Grant Gustin and Jesse L. Martin to get up in front of the comic-con audience to tap dance. A Flash in Time: Time Travel in The Flash Universe (21:47) – This is about as much of a documentary as you can get as it doesn’t address the television series at all and instead looks at time travel as a theoretical concept and then relates it to The Flash comic books. I’d say this one is worth skipping. A Conversation with Andrew Kreisberg and Kevin Smith (3:55) is audio, mostly from director Kevin Smith, (talking to producer Andrew Kreisberg) about his experiences directing two episodes of The Flash and one of Supergirl. The audio is set to clips from the two series. Gag Reel (4:04) – These are some amusing moments of goofing around on set and dancing between takes. Any profanity is bleeped out, except what appears to be one quiet “F” word while the camera is focused on Candice Patton’s face and Grant can be heard quietly talking to her. “I Know Who You Are” Deleted Scene (1:35) – In this scene, Joe’s girlfriend from the precinct comes to tell him about an attack at Jitters but he can’t tell her the details he knows about it. “Finish Line” Deleted Scenes (2:46) – In the first scene, Cisco and Killer Frost talk, trying to turn each other. In the second scene, Barry and Joe talk back at home and Joe encourages him.